As you already know, Taylor Photo has created an account for you - to make the process of downloading images easier. You now have the User Name and Password to gain entry into your account. It is also possible to access your protected Gallery from the Taylor Photo Home Page - at the bottom of the TaylorCorporate section. Remember this login as it will be needed at the end of your session (for added security). 5" x 7" 'print' resolution (300 ppi). Selections of the print resolution images - above 10 - will be at additional charges based on pre-arranged pricing. 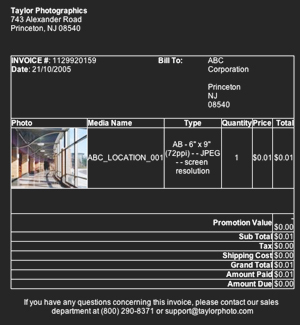 Higher resolution images (up to approximately 16" x 20") can be ordered by email at additional pre-arranged charges by providing the image file name and size desired on the form included on your web pages. We will send you the link and confirmation of those charges. Contact us to order larger files or TIFF files. Your on-line Corporate Account contains custom photo session images from the previous 6 months. 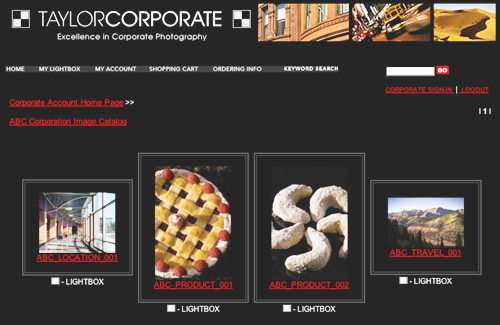 When you login to your account, you will see all of the images in your catalog. Browse through each page to view the results and find images needed for your project. You can also utilize keyword search to find particular images or image types. Note that the Pricing appears only to allow you to continue and you will not be charged during this session for your downloads. File downloads that are in excess of those described above will be charged to your account on a monthly invoice. 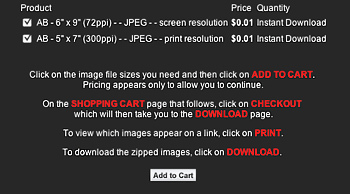 The shopping cart displays details of the images you wish to download. If you wish to delete an image from your list before proceeding to checkout, simply click the "REMOVE" link. If you wish to continue selecting images, click on the "CONTINUE SHOPPING" button. Once you have selected all of the images you need, click on the "CHECKOUT" button. You will need to LOGIN at the top of the page using your User Name and Password selected for you when we set up your account. This simple process will then take you to the DOWNLOAD page. Download Page After "Checking Out" you will see a final confirmation page with a summary of all your recent downloads. In order to see the pictures associated with each activity, simply click on "Print" and a new window will open to display images from that transaction. Clicking on the link "Download" will immediately initiate a download to your computer - usually onto your Desktop. These are ZIPPED files to save on space and download time and will self-extract creating a folder with all of your images. We offer premium printing services for any and all of your Corporate Images. This includes our comprehensive options for unmatched print quality as well as CMYK Conversion and proofing for your Offset Printing applications. Do you have digital files up to 50MB in size and need our premium output services? Learn about our FTP Service and how to send us image files - and what types of files we accept. Learn More about our high quality printing options, including LARGE PRINT output. Contact us for more information or to order prints from your Catalog. 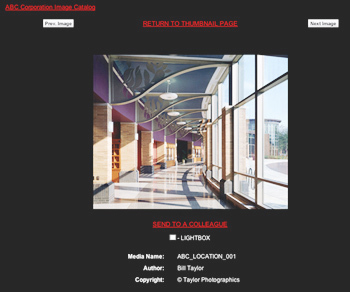 All images in your TaylorCorporate Gallery are available as digital RGB JPEG color files. The download package is in ZIP format. Contact us to order larger files or TIFF files. All digital files, whether for web use or print use, are subject to our License Agreement. Please read for details on usage.